Your Employees Are Going To Love This! Are you a benefits broker, consultant or product or service provider? You'll want to be the first in your market to read this book. Be ready to help employers looking to expand their menus of Voluntary Benefits. For all employers, this is the must-read book to gain a unique advantage in today's growing competition for the best talent. For all benefits vendors, this is the must-read book to better understand the employer's view point on Voluntary Benefits. Introducing 21 VOLUNTARY BENEFITS that can help every business and organization be a great place to work. Employees choose and buy these sought-after benefits— ranging from Critical Illness to Pet Insurance to Identity Theft Protection. Our new eBook is a quick guide to 21 VOLUNTARY BENEFITS that are popular with employers and appreciated by employees. Employers are looking to increase productivity by having a more focused workforce. Innovative employers are finding answers by offering modern Voluntary Benefits. Employers are learning that there are 21 Voluntary Benefits that can improve every employee benefits program without additional direct costs. 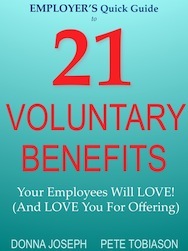 Here’s a sample of the 21 VOLUNTARY BENEFITS employees love!